It’s evening in Cheyenne, WY. Though it’s a lovely night, the all-gravel KOA we are hunkered down in (while we wait to get our Jeep back) is in an industrial part of town and I prefer muffled sounds of the nearby trains, so I’m enjoying some time inside at the dinette. The kids were both asleep by 9pm this evening, which for this trip is an accomplishment worthy of the second glass of pinot noir i’m sipping; I’ve just finished a delicious bowl of chicken vindaloo with naan, but I can’t be bo thered to clean up dishes in my tiny kitchen. I can finally reflect upon the 8 nights we spent in Rocky Mountain National Park (RMNP)! Our time at Rocky Mountain National Park was full of wildlife, incredible views, altitude sickness, playground fun, pony rides, grilling, long walks, short hikes, starry nights, thunderstorms, naps, cleaning, down time, movies, difficult bed times, bear warnings, eating out, filthy kids, and barking dogs. Upon waking in the Walmart parking lot, Raj took the Jeep to find coffee and breakfast (remember we had no water?). We also called around for accommodations and got lucky with a place in Estes Park, the East side of RMNP. Raj called countless RV service places while I got the kids and RV rode-worthy and he finally secured an appointment for 10 days later in Cheyenne, WY to get the tow bar and brake system installed on the Jeep. Once those essentials were accomplished, we got on the road, stopped at Costco and stocked up for the week ahead and drove through Boulder (I was bummed not to spend any time there but we couldn’t find a place to stay). 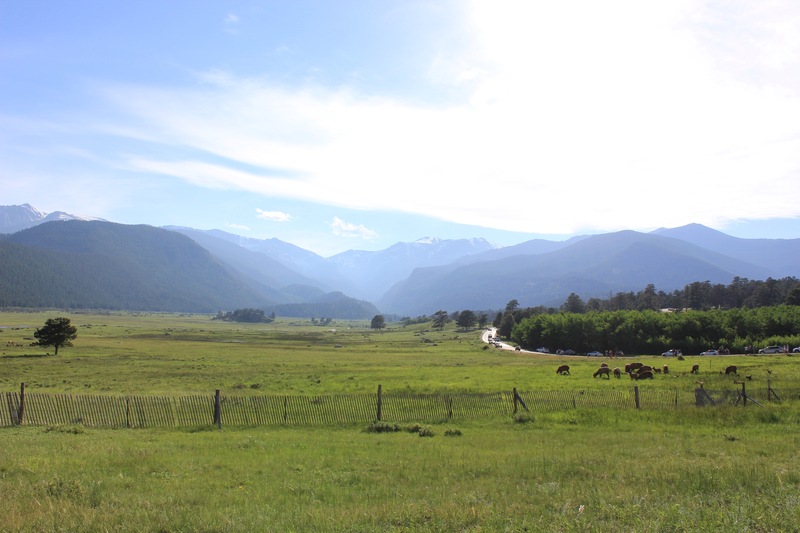 What a gorgeous drive to Estes Park though – winding roads, snow capped mountains, horses, streams/rivers, and hippie towns with Cannabis shops, native art, and outdoor bars – the little of town of Lyons really stood out – I wanted so badly to stop and enjoy the afternoon there! Even though we needed to push on, I was incredibly happy to have made it to this portion of the trip! 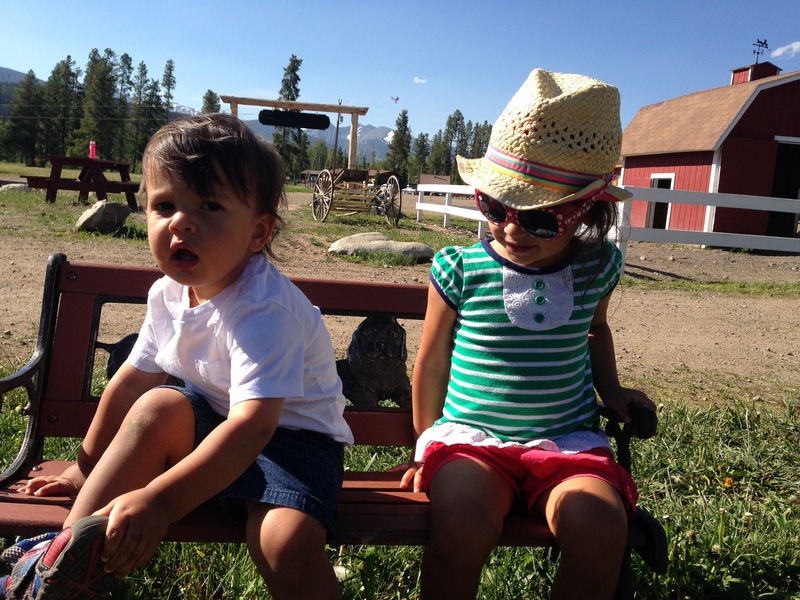 We checked into a wonderful campground in Estes Park and instantly regretted that we only had 1 night there. We had a great site and their amenities were fantastic. 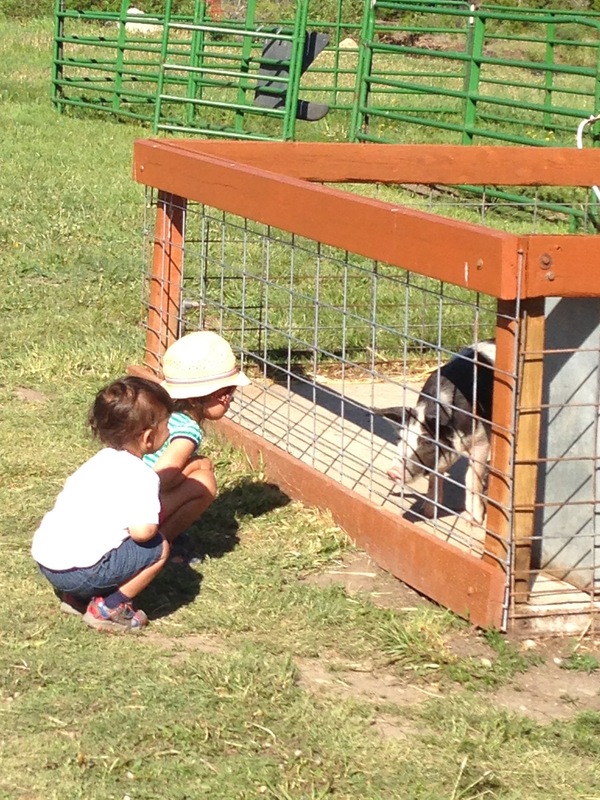 Chai had a blast at their huge dog park and made a new friend – a 5-month-old MASSIVE puppy. I’ve never seen such a clumsy animal – this pup was 50 lbs of shaggy, adorable cuteness. Chai ran circles around him and he whimpered when he couldn’t keep up, and they were both worn out after their romp. We visited the Beaver Lake Visitor Center that afternoon and got some info on kid-friendly hiking trails and then entered Rocky Mountain National Park ($40 for an annual pass, which we needed because the $20 weekly pass would leave us a day short). We saw a huge herd of elk within our first 5 minutes of entering! They were so close! London was dozing already but with the help of our new soft-top Jeep Wrangler with the top half back, we were able to get some great photos without even getting out! We enjoyed a nice drive through a section of the massive Park, saw a buck chilling by a river, and took in the majestic scenery. 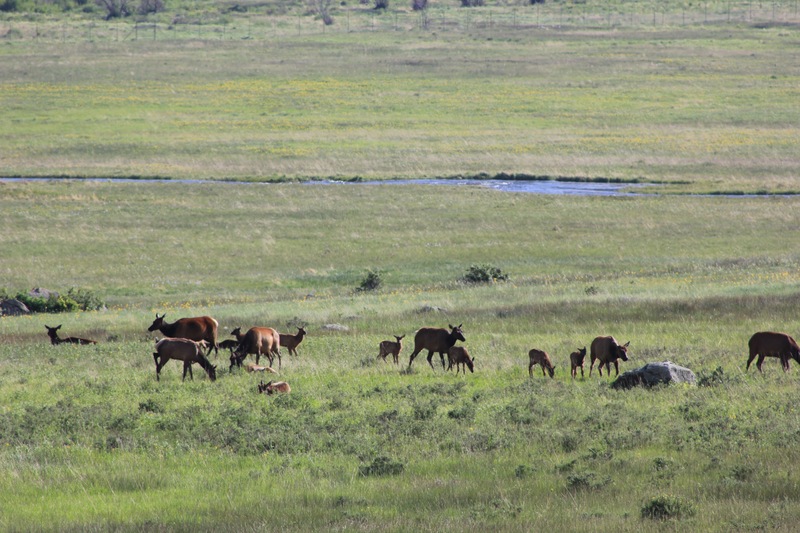 Tourist tip: if you are into wildlife viewing, drive through the park between 5pm – 9pm – every single time we went in during those hours, we saw countless elk and a few Moose! We wanted to eat dinner at the family-friendly tavern at the lodge and enjoy some live music and drinks/dancing with the kids, but Nina fell asleep on the way back from our drive at 6:30pm and would not wake up again, despite our efforts! I guess the week of crazy, non-existent routine/schedules had caught up with the sweet girl; she slept until after 7am the following day! So instead of finally having a meal someone else would clean up after, we ate leftover chicken and salad outside with London, who was amped up and ready to play and giggle for hours more, and then when he was finally in bed (I think it was close to 10pm!!!) I wrote for as long as my eyes would stay open and then, once again, crashed hard. Elk Meadow Lodge & RV Park: 4.5 stars So friendly, great amenities, live music, large clean dog park, good playground, views, nice looking pool/hot tub though we didn’t use it, miniature golf, fabulous location. they have it all. Main reason I couldn’t give 5 stars was because they have a late checkout fee of $25. I only requested an hour or 2 and their policy is 3 hours for $25 or to move to storage and still pay $15. If the campground had been full as it had been the night before, I’d understand this more, when we left at 11am Sunday, it was half empty. But other than that, this place was great. Father’s Day! We woke up with London’s charming help (he wakes up yelling “help me” to get out of his bunkbed) and though I was going to let Raj sleep in and take the kids to pick up donuts in town (hey I have the freedom of a Jeep now after all! ), the kids and dogs made it impossible. Raj begrudgingly got up and came with us. We found an adorable and impressive family run donut shop with a line out the door, picked up a dozen and coffees, sat outside and watched London and Nina stuff them in their mouths. We realized it was potentially still early enough to get in a good hike, so we drove back to pick up gear. However, the Lodge wouldn’t give us an extra hour or 2 late checkout so we thought we could still squeeze in a short hike around Bear Lake in RMNP. Sadly, the parking lot at Bear Lake was jam packed by the time we got there about 9:15am and we didn’t feel we had enough time to wait around because we were already cutting it close to hike, drive back, and get packed up to check out at 11. In truth, we never would have made it, as even skipping the hike, and settling for a scenic morning drive instead, we were about 15 minutes late checking out (it still takes us forever to get on the road because we have to juggle the kids as Raj handles packing up the outside, and I secure the inside). We only left Elk Meadow because we had reservations at Winding River Resort on the South end of RMNP in a town called Grand Lake. I had been looking forward to this stop because the “Resort” is in a more remote location just inside the south entrance to RMNP, equestrian friendly (as in people who camp with their horses come here, as well as guided horseback tour offerings), has fun stuff for the kids like an Animal Farm with chickens, goats, pigs and miniature horses, Pony rides, ice cream socials, hayrides, and it’s all within the park for hiking and scenic drives, as well as 5 minutes into the quaint Grand Lake Village. Furthermore, our reservation was for an entire week! Time to settle in! However, to get to Grand Lake, we needed to drive the Trail Ridge Road which crosses 48 miles of the RMNP and the continental divide. Since we didn’t have the tow bar installed yet, Raj drove the RV with the dogs and I took the kids separately in the Jeep. The drive offered breathtaking views, but also white-knuckle, hairpin turns around cliffs without guardrails. At the top of the mountains, at an elevation above 12,000 feet, the wind was incredibly strong and as I followed Raj, I could see the RV being blown around by the wind. It was terrifying! While I was gripping the wheel, my (lunatic) husband was taking a video as he drove! 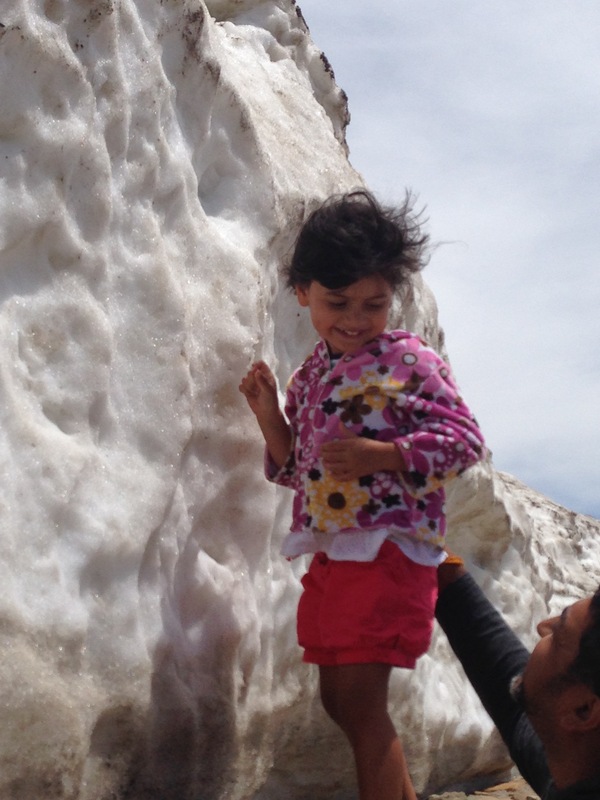 We stopped at a visitor center near the top to take a breather and because Nina insisted on touching the snow! Luckily the rest of the drive down was easier, but I was relieved to finally make it to our camp for the evening. At first, we weren’t sure it was going to live up to our expectations, as our site didn’t have very good views, but once we went for a nice walk to explore, we were very glad to be spending a week in one lovely place. Winding River Resort: 4 stars – maybe 4.5. water or water pressure went out a couple times but they got it going within a few hours– no dog run despite size of property. Incredibly dusty, but they sprayed some kind of sulfuric acid or something on the main roadways to help with that… sounds kind of scary, but hopefully since the resort is within the RMNP, the product is monitored? Very beautiful and equestrian oriented. Very nice to take walks and see the River, mountain views, horses as well as all the campers who are staying with their own horses in private paddocks on their site. However, I personally wouldn’t stay here for an entire week again solely because of the lack of off-leash dog area – it’s just not fair to our dogs. I would certainly stay here again for a shorter time period and would recommend the place. The sun in my eyes woke me and both kids were in bed with us because it was cold! London stirred and I peeked at him as he sweetly patted Nina’s head. Sibling love amazes me. Somehow the dogs sensed we were waking and came bounding in and jumped all over us – Chai burrowed her head into me and plopped her 70 lbs on top of me; Stella whipped us with her tail. Time to get up. I started coffee and gave London a leftover donut as Raj walked the dogs; amazingly, Nina slept for another 1.5 hours! Later we went for a bike ride to the Kawuneeche visitor center to get some more info on hiking the south side of the park. I pulled the Burley chariot, which normally adds a bit of effort but nothing too strenuous. This time, I was struggling, and it was only about 4 miles round-trip! It finally occurred to me when I was out of breath and vaguely nauseous that the elevation must be the culprit. Sure enough, Grand Lake and Winding River are still over 8400 feet elevation. 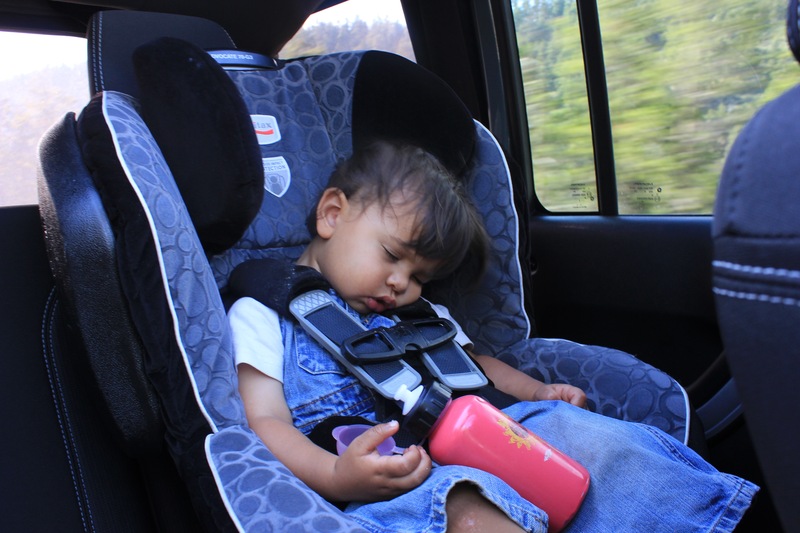 We planned on getting the Jeep and finding one of the trailheads that leads to a waterfall, but London fell asleep on the ride back to camp (you may find this to be a common inconvenience for us). We adjusted our plan and unhitched our fancy chariot, converted it to a stroller, grabbed the dogs and went for a long walk through the lovely resort. We stopped on the way back at the playground for Nina to play and London woke up and joined her. While there, another camper informed me that bears had been spotted roaming the camp every night lately and that the resort now had nightly guards – awesome! We figured we still had time for a hike and to grab lunch in town, so I dropped the dogs, grabbed snacks and hiking boots, and Raj and I proceeded to spend about 30 minutes figuring out how to take the top down on our new Jeep. What an ordeal! Thanks to YouTube, we succeeded and drove into town in style. Luckily the kids loved it; we were gambling because the previous couple of days they complained when we took it half back or when we rolled the windows down. Apparently, they are all or nothing kiddos; with the top down, they both smiled and giggled continuously. YAY! Grand Lake Village is fantastic – it’s quaint, friendly, has beautiful views of mountains, sits right on a gorgeous lake with a nice breeze, and offers many cafes, restaurants, shops and markets… the village center has a large pavilion with events like BINGO and Chili cook-offs, as well a huge playground – it’s just a wonderful vibe. We enjoyed some Mexican food for lunch (that somebody else cooked and cleaned up after) and then got the kids ice cream. Unfortunately, it was late and the kids didn’t seem up for a hike anymore. We played it safe and London fell asleep within a few minutes of getting back in the Jeep and Nina asked for quiet time in her jammies. Once both kids were in their bunks, Raj and I both took naps too! It. Was. Amazing! However, Nina never did nap and crawled into bed with me an hour or so later to play. Waking from our naps was difficult but we needed to let the dogs out and start thinking about dinner for the kids. We ended up just walking to the Animal Farm for the kids to play with the goats, chickens, pigs, and bunnies, and to look at the horses, and then we ate leftovers outside (chicken, tri-tip, and asparagus) and I made a quick salad as Raj started a fire so we could toast marshmallows for dessert. I had opened the windows in the RV to enjoy a breeze but the fire outside was smoking and the fan in the RV was sucking it all in – I had to vacate with burning eyes and throat! Camping life I suppose. When the kids were finally in bed (late again) Raj and I enjoyed some quiet by the fire and gazed at the sky full of twinkling stars. We were finally settling in! Have an awesome Independence Day!